Christmas Eve was impossible to have a date night. We had my parents over for a Christmas Eve dinner then opened gifts with them. They left late that evening. But Christmas, we started getting snow around 11 a.m. We still made it to my grandparents’ home for Christmas that afternoon, but came home early to avoid ice on the roads. It worked out great. Once we arrived home, we put the kids to bed and had the rest of the night to ourselves. We took that opportunity to have a date night. Lesson #1: Sometimes the weather can work in your favor for a date night. 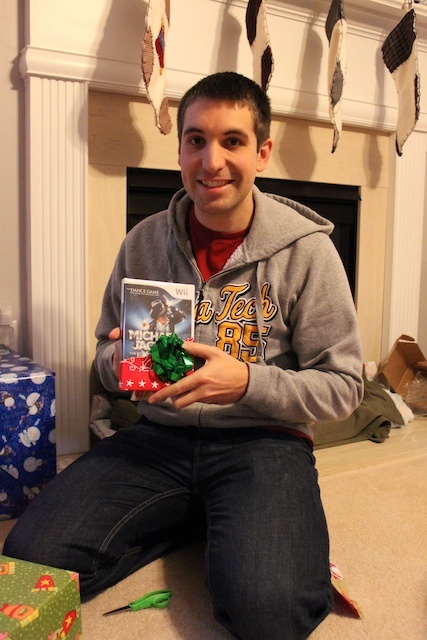 For Christmas, I got Just Dance 2 and Nathan got the Michael Jackson The Experience for the Wii. Once the kiddos were in bed, we got our groove on trying out both those games. The games were so much fun. It was a good work out too. A great way to end a wonderful Christmas and our last date of Project 52: Date Nights. Lesson #2: We have had the best time dating each other for Project 52. We will be doing this again next year. I just won’t be posting about it weekly next year. Maybe monthly review of all our dates. Nathan said: Tiffany has much more dance training (and probably natural rhythm) than I do and it showed as we played these games. She would easily double my scores. It was fun to dance the night away and I got a little better over time. I might have to sneak in some dance session without her so I can catch up and beat her high scores. » Tell me… How has Project 52: Date Nights worked out for you? What were some of your challenges and difficulties that preventing you from dating weekly? What were some benefits you saw from weekly dates? Want to join Project 52: Date Night? Great! Start anytime. Go here for details about the project and print the pledge. Tiffany – thank you for leading us on this amazing journey! It has been a fun challenge and one we have greatly enjoyed! How amazing to make it all the way to the end of the year!!! May 2011 be even better as you date your husband one date at a time. Just wanted to say thanks for Project 52! We are now in the habit of dating each other with no plans to stop soon! Thank you so much for sharing your journey. It really inspired us. Not only do the hubby and I check in each week, but we have made an effort to get a sitter and go out, too. I really enjoyed participating in Project 52 Date Nights. I think intentionally making the effort to date enriches your relationship. We missed our date this week but we have generally gotten into a good pattern. It is great to make the effort each week and get good ideas from others too. Thanks for starting this.